Until recently, policy evaluation has mostly meant assessing whether government programs raise reading levels, decrease teen pregnancy rates, improve air quality levels, lower drunk-driving rates, or achieve any of the other goals that government programs are ostensibly created to do. 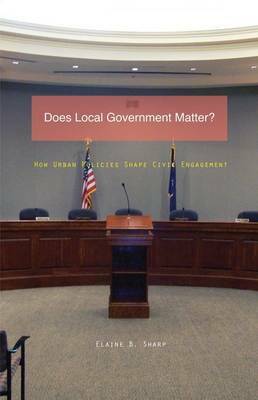 Whether or not such programs also have consequences with respect to future demands for government action and whether government programs can heighten-or dampen-citizen involvement in civic activities are questions that are typically overlooked.This book applies such questions to local government. Employing policy feedback theory to a series of local government programs, Elaine B. Sharp shows that these programs do have consequences with respect to citizens' political participation. Unlike other feedback theory investigations, which tend to focus on federal government programs, Sharp's looks at a broad range of policy at the local level, including community policing programs, economic development for businesses, and neighborhood empowerment programs.With this clear-eyed analysis, Sharp finds that local governments' social program activities actually dampen participation of the have-nots, while cities' development programs reinforce the political involvement of already-privileged business interests. Meanwhile, iconic urban programs such as community policing and broader programs of neighborhood empowerment fail to enhance civic engagement or build social capital at the neighborhood level; at worst, they have the potential to deepen divisions-especially racial divisions-that undercut urban neighborhoods.